If you've been to the 2008 Summer Games site that we created to help you stay updated on the happenings in Beijing this month, you'll notice a Custom Search box in the upper right corner that will offer you results from a set of sites that cover the games. 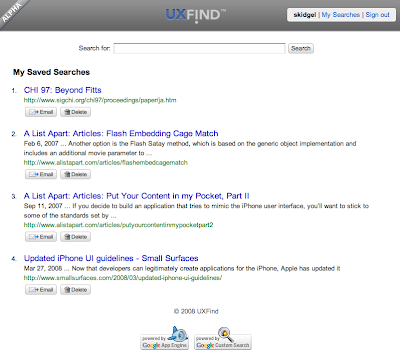 This customized search experience is similar to what many of our users have been doing with Custom Search - defining their own slice of the web to search. Since we launched Custom Search, developers have found interesting ways to use the platform and the API (did you see our new developer guide?). One interesting way to build a customized search experience is by using linked Custom Search Engines (CSEs). With linked CSEs, you can create a dynamically defined search engine that can be updated automatically. A cool application to create a personalized search over your del.icio.us bookmarks is described in the tutorial Build a Custom Search Engine using your Social Bookmarks. You can export your bookmarks to define a CSE and search across all the stuff you care about. Many social bookmarking sites make this kind of application easy to build by providing tools for exporting bookmarks or by listing all bookmarks on one webpage. Other services provide similar functionality. Here's a screenshot from a CSE builder application that does this. You can create a CSE on the fly using the MakeCSE tool. Provide the URL of a page that has a bunch of hyperlinks and MakeCSE will extract the links, construct a CSE, and provide you the search results instantly. As the links on the page change, the CSE is automatically updated. A CSE for your blog. Try out this Blogger widget that searches your Blogger blog and blogrolls automatically. CSE for bookmarked URLs that have a particular tag on del.icio.us, for example, http://delicious.com/tag/photography?setcount=100. CSE 'for searching pages with links'. This would be great for webpages that have a lot of links, such as the directory category pages on the Open Directory Project website. CSE that searches across URLs that your friends are embedding in their Twitter messages. Let us know in your feedback if you've built interesting tools using the Custom Search platform. We'd also like to hear if there are things we can do to make Custom Search easier to use.